Everyone can appreciate a little breathing room, some space to lay back in after a long day or a chance to move around after being cramped in an office desk or in a tight sedan seat all day. Our luxury apartments at Alexan Summit bring a whole lot of space and comfort to the table, from our petite and pristine studios to our gargantuan two-bedroom models, so you’ll have the best amount of elbow room for your needs. One of our many one-bedroom luxury floor plans, the A2A, brings a generous helping of space, style, and serenity, approximately 958 square feet of space to be precise. The main bedroom can easily accommodate a king-sized mattress, great for catching up on much needed rest. Invigorate your body and mind in the spa-inspired bathrooms, complete with a large soaking tub and an expansive walk-in closet for easy outfit organization. Prepare your favorite meals and treats in the open kitchen, featuring ample pantry and cabinet space and a raised breakfast bar. Play around in the ultimate living room, with over dozens of different options: set up your entertainment center and binge your favorite shows on the comfy couch, invite loved ones over for game night or socialize in the open space, bring in family and friends for the holidays with a nice dining set up, or step out onto the private balcony and admire amazing downtown Fort Worth views. Find your new place with a ton of space here at Alexan Summit. 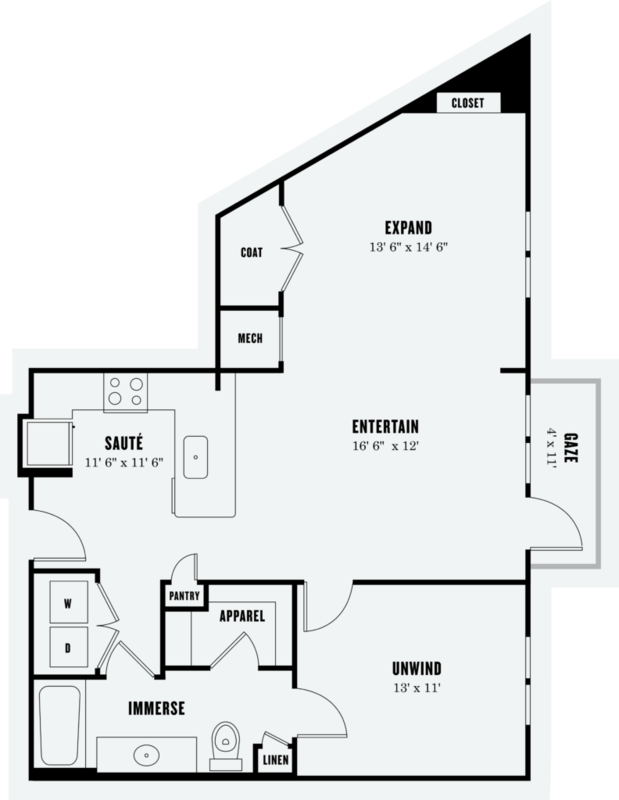 Take a look at all our incredible luxury apartment floor plans, including the A2A, today.